I went to the Payless Warehouse again on Saturday.hehe.This time I went with my family & my mum paid for the books instead!yessss..haha.I bought 7 books & only 1 of them were fiction.I couldn’t find the Elvis & Me book that I had to forgo on Friday because I wanted to keep to my budget,plus I’ve watch the movie version of the book. -When I saw this book,curiosity got the best of me & I had to have it.I love books on the CIA & FBI because I find them very intriguing.Plus this thick book on the FBI sheds a lot of light about what really is the FBI.Even my mum and my brother Haziq who doesn’t like to read books were interested in the book. -Blame my love for the tv series Alias for my interest in Nostradamus. The author of this book has studied the life & writing of Nostradamus for more than 40 years!This book is very extensive & I can’t wait to find out more about him. Though I wish the book on Nostradamus along with his prophecies in pictures that I saw on Friday was available but it wasn’t there anymore either!Damnzz. -I just had to have this book.The poems & drawings were just way too cute for words.Plus I saw the book one a talk show a while back or was it in one of the old InStyle mags that I still keep? -As most of my friends know, I always, always dream of going to Rome or Tuscan anywhere in Italy for that matter (look at the title of my blog, it’s in Italian!). I even came close in taking Italian as my 3rd language with Izza during part 3 but due to technical problems, we had to take Japanese. This book is said to be, “For anyone who loves things Italian, this insider view of the most mature city on earth is the perfect companion.”Perfect!Alan Epstein has written other books & has even appeared on Oprah. -For the inner child in me. :)..Nuff said. Plus, it’s a children classic! Ah, the man in Back to the Future. I admire how strong Micheal is in fighting & living with the Parkinson disease. This book will give a great insight about how he deals with the disease & living with it. 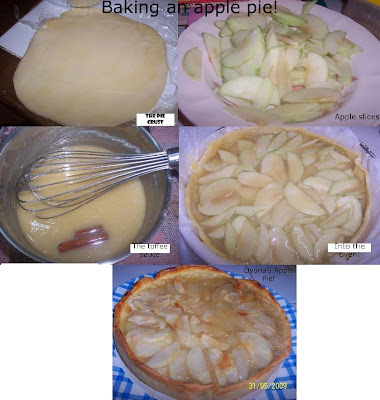 During the hols I bake apple pies.3 to be exact & had I known it was easy to make, I would have made it long time ago..haha. Maybe I’ll branch out & try baking a pumpkin pie or chocolate..yumm!Here’s the pic the pie that I baked. I bake 1 for Kak Hani, my cousin & 2 for my family.I swear it taste like Mc D’s but atleast I know that I’m using real ingredients..no artificial things in it..haha.